NOTE: THE ACID ATTACK IN OREGON TURNED OUT TO BE A SELF-INFLICTED HOAX. In recent days there have been two brutal acid attacks against women in the United States, one in Oregon and one in Arizona. Many of you have read the story I wrote about a courageous acid attack victim from Kampala, Uganda named Juliette on this blog. HDNet’s World Report aired an “in her own words” piece about Juliette that I produced for the show on April 14, 2009. It is a very powerful story and Juliette’s ability to forgive her attacker and move on is inspirational. We saw her again when we were in Uganda this past summer. She is now a mother of two children and despite her injuries she is still beautiful and trying to make the most of her life. I hope you are as transformed by Juliette’s story as I was and as horrified by this unbelieveable terrorism against women, not only in the developing world but also here at home. We cannot let the perpetrators of these crimes go unpunished. If we cry loud enough we can prevent more women like Juliette from becoming victims of this terrible violence. Categories: Acid Attacks, Africa, Crime, Health Care, Human Rights, India, Inspiration, Law and Order, Media, Middle East, News, News and Views, Poverty, Random Thoughts, School Violence, Television, Terrorism, Travel, Violence, Women | Tags: Acid Attacks, Arizona, HDNet, Juliette, kampala, Oregon, Uganda, World Report | Permalink. 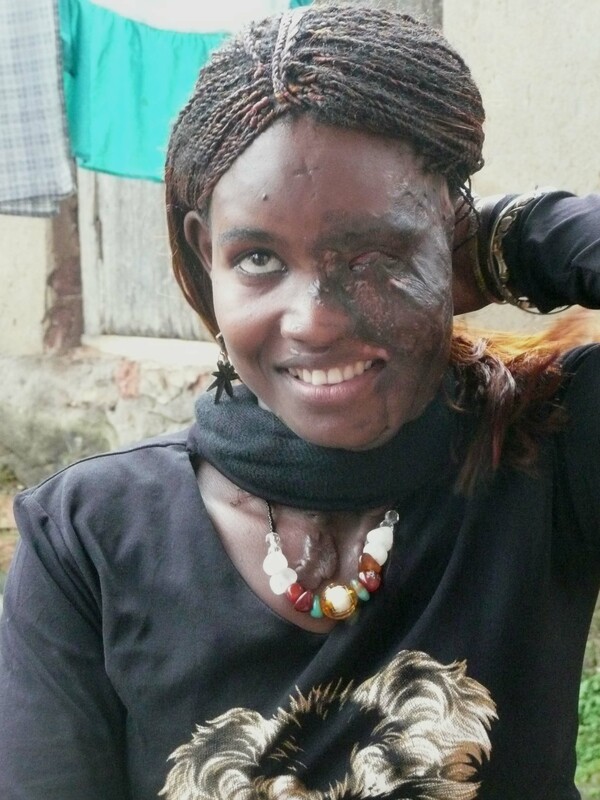 Many of you have come to this blog to watch the story about Juliette and read about her brutal acid attack in Kampala, Uganda (http://vimeo.com/5703299.) I had always considered the violence against Juliette and other women like her as personal. Jealous men destroy the lives of women who threaten them in some way. Nicholos Kristof of the New York Times writes widely on this subject as he moves about the developing world. In the following blog, Jim Verhulst of the St. Petersburg Times, argues that terrorism like this needs to be considered in the larger political framework, especially as President Obama ponders what to do in Afghanistan where attacks like this happen frequently. Can we realistically bring change to a country where it is entrenched that there is less value to a life that is poor and female. Nicholas, Jim and I are among those who are trying to give a voice to women who are victims of this kind of atrocity. So is Emilio Morenatti of the Associated Press. He took the photos you are about to see and these portraits of damage and despair are shocking. How can men do this to women and what can we as a compassionate world do? We must honor the beauty and spirit of these women, and women like Juliette, by stopping this carnage once and for all. The choices we make as we contemplate our missions abroad must also keep this in mind. Categories: Acid Attacks, Africa, Barack Obama, Children, Crime, Global Poverty, Human Rights, Inspiration, Law and Order, Media, News, News and Views, Photography, Politics, Poverty, Religion, Terrorism, Travel, United States of America, Violence, Women | Tags: Acid Attacks, Afghanistan, Associated Press, Emilio Morenatti, Jim Verhulst, kampala, New York Times, Nicholas Kristof, St. Petersburg Times, Uganda | Permalink. Many of you have read the story I wrote about a courageous acid attack victim from Kampala, Uganda named Juliette on this blog. HDNet’s World Report aired an “in her own words” piece about Juliette that I produced for the show on April 14. It is a very powerful story and Juliette’s ability to forgive her attacker and move on is inspirational. I hope you are as transformed by Juliette’s story as I was and as horrified by this unbelieveable terrorism against women in the developing world. More often than not men go unpunished for this. If we raise up our voices loud enough perhaps we can prevent more women like Juliette from becoming victims of this terrible violence. Categories: Acid Attacks, Africa, Global Poverty, Human Rights, Media, News, News and Views, Poverty, Terrorism, Women | Tags: Acid Attacks, BeadforLife, Global Poverty, HDNet, Juliette, kampala, Nicholas Kristof, Terrorism, Uganda, World Report | Permalink.